In the midst of the craze for Post Modern designs, highlighted by its open-pediment, high-boy design for a new headquarters for A. T. & T. on Madison Avenue at 56th Street, the architectural firm of Johnson/Burgee put part of a huge mansard roof atop this 76-unit cooperative apartment building. The part was merely the front façade and the "false-front" design, which can be easily seen from the north or south, was widely criticized. "High-rise pretentiousness with an openly ersatz mansard roof whose true nature is apparent to any who care to look. An architectural conceit raised to new heights," remarked Elliot Willensky and Norval White in their book, "The A.I.A. Guide to New York City, Third Edition," (Harcourt, Brace Jovanovich, 1988). Slanting buttresses support the tall screen roof element and while the avenue façade is entirely limestone the other sides of the building are covered in buff brick. 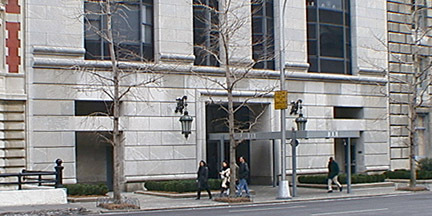 Despite its notoriety over the "billboard" roof design, however, the building is impressive at street level with a very handsome entrance and partitioning with rounded courses of the façade to complement the courses and cornice line of its supremely elegant neighbor to the south, 998 Fifth Avenue designed by McKim, Mead & White. "But the dark gray bay windows and their connecting metal spandrels form strong vertical elements that totally negate these horizontal strips. And the 'honest,' or tongue-in-cheek, gesture of stopping the moldings short of the sides of the building may be amusing for those in the know, but their use just seems unresolved. It does not help that the moldings look like sliced-off Tootsie Rolls," remarked architecture critic Ada Louise Huxtable in her book, "Architecture Anyone?" (The University of California Press, 1985). "The entrance, however, has the elegant Johnson touch. Designed originally as a Sullivanesque arch - a feature that was abandoned - it has turned out to be the least 'reminiscent' feature and the best part of the building," Huxtable maintained. The mansard-roof element was obviously intended to mirror the real mansard roof of its low-rise mansion neighbor just to the north, the former Benjamin N. Duke residence designed by Welch, Smith & Provot. Also to its credit is the extensive use of limestone on the avenue frontage, something that many other "luxury" high-rises opted not to do. 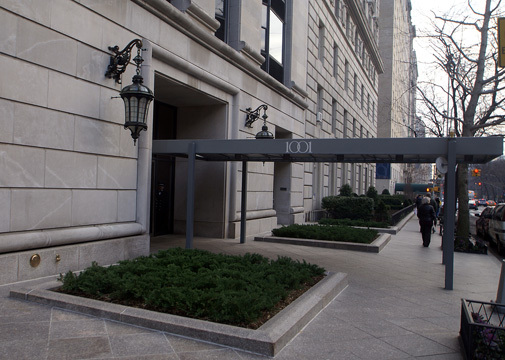 The division of the avenue frontage into four bays of windows, wide at the ends and narrow in the center, reflects a preoccupation with fenestration patterns by Philip Johnson and John Burgee, the design architects for this project by Peter Kalikow. The strong verticality of the window patterns, however, does not work contextually with its neighbors. Philip Birnbaum & Assocs. were the associated architects. 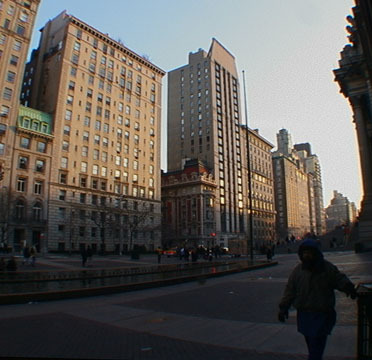 Completed in 1979, this mid-block building between 81st and 82nd Streets is directly across from the Metropolitan Museum of Art. It has a canopied entrance flanked by two large landscaped beds and very attractive hanging lanterns.